Maintain radiant and healthy skin with The Ordinary “B” Oil, a multi-tasking treatment oil to promote natural skin defence and beautifully nourish the complexion. ”B” is for blend! 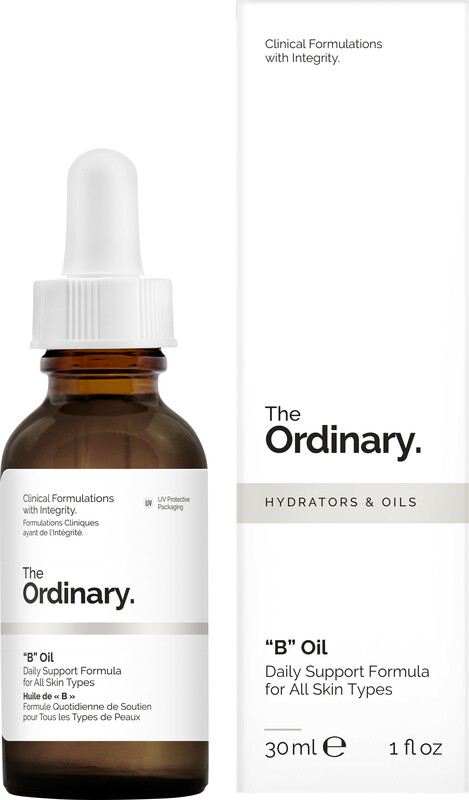 And this effective oil fusion from The Ordinary certainly blends a cocktail of effective skin-loving oils and soothing ingredients to create something that is truly wonderful for the skin. The oil absorbs quickly, doesn’t have a greasy feel to it at all and has a lightly scented natural aroma of the sea. Quenching, soothing and softening, this oil works well for all skin types, in particular oily skin that is prone to breakouts and cystic acne. It’s also very good for sensitised skin, as it can help to soothe conditions such as eczema. If luminous, glowing and plump skin is what you’re looking for, “B” Oil is the solution. As well as a host of nourishing oils such as marula, argan, baobab, pataua, brazil nut, rosehip and borage, “B” Oil contains crambe abyssinica seed oil, a great solution for acne-prone skin because it closely mimics sebum and can help regulate its overproduction. ”B” is also great for dehydrated skin. The inclusion of skin-quenching bisabolol provides healing, anti-inflammatory and anti-microbial properties and assists the other ingredients to penetrate deeper into the skin. With so many different skincare oils on the market, sometimes it’s pretty confusing and difficult to choose one. This is why we love “B” Oil so much! It’s jam packed with lots of different skin-benefiting oils and loaded with nourishing and calming ingredients so you can reap the benefits of many different skincare ingredients and oils in one handy product! ”B” Oil can be used either in the morning, evening or both. Simply massage a few drops into the skin and allow to absorb. Perfect to pair with your daily moisturiser, why not add a few drops of “B” Oil to The Ordinary Natural Moisturising Factors for an extra boost of goodness and hydration. Water-free, alcohol-free, silicone-free, paraben-free, sulphate-free, mineral oil-free, fragrance-free, gluten-free, cruelty-free.